After paving its way in offering affordable domestic and international flight via Clark International Airport, Philippines' AirAsia, a 60-40 joint venture between Filipino investors Antonio O. Cojuangco, Michael L. Romero and Marianne B. Hontiveros, and Malaysia’s AirAsia International Ltd., is happy announce their modernized and newly opened Hotline Number and Cash Payment Centers. 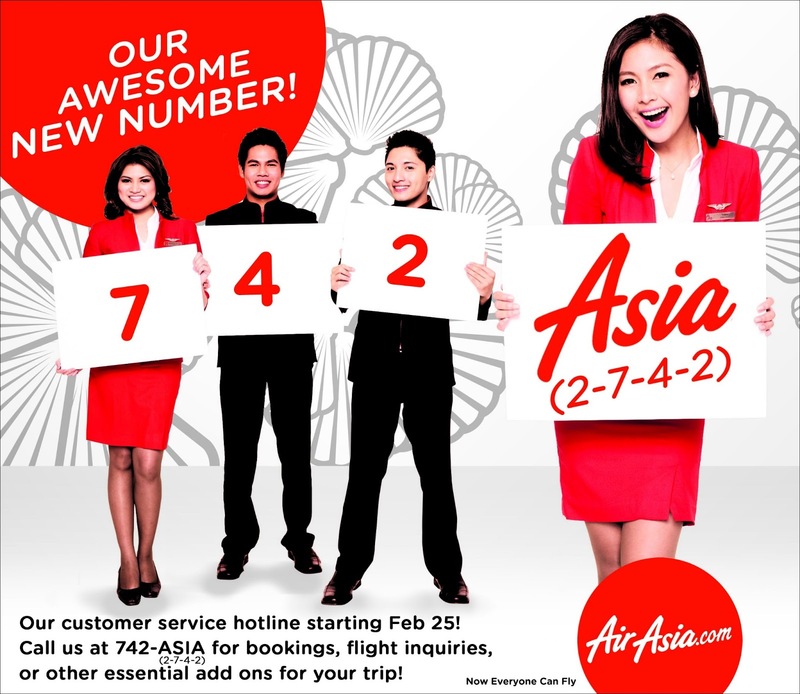 This wholly-owned subsidiary of AirAsia Berhad, which has won SkyTrax’s best low cost airline for four consecutive years, is happy to introduce their new customer hotline number 742-ASIA or 742-2742. 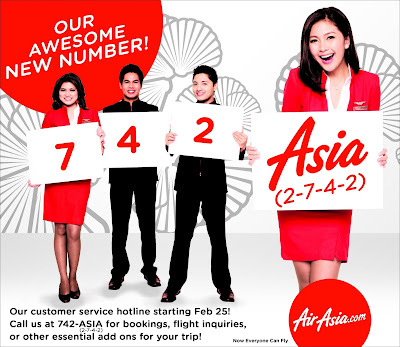 Started last February 25, Philippines’ AirAsia, the low cost carrier with the youngest fleet, significantly changed its customer call center number promising to provide a more handy and easy way transaction or communication to the company. As for the Cash Payment Partners, Philippines’ AirAsia is also rolling out our cash payment partner with 7-Eleven store for their passengers who want to avail of our online promo and other privileges but would like to pay in cash instead of using their credit cards. AirAsia Inc. Commercial head Freddy Herrera said that they are hoping that Filipinos will embrace this new concept of paying cash for airline tickets via their payment partners option because of its simplicity and convenience. The payment partner service is said to cover all Philippines’ AirAsia flights from its hub in Clark International Airport to Taipei, Singapore, Hong Kong and Kuala Lumpur including domestic flights to Davao and Kalibo (Boracay). And since there are more than 800 7-Eleven stores nationwide, which will start accept cash payments for AirAsia, the convenience of using cash when paying for AirAsia promo fares and other online purchases at www.airasia.com will be as easy as 1, 2 and 3. Meanwhile, AirAsia’s new Philippine hotline number, +632.742.2742, is open daily, from Monday to Sunday, at 8:00AM – 9:00PM. “We are expanding our payment partners service to include other outlets in the coming weeks so that more and more people will benefit from AirAsia’s awesome low fares and extensive route network covering 80 destinations in 20 countries,” Herrera concluded. So, what are you waiting for? It's summer time, it's time to choose your destination! hotline nyo nakaka dismaya ang tagal tagal mag antay ikaw na lang mismo ang susuko kasi wala namang sumasagot puro tugtog lang..hayyyyyy!!! !